Hundreds of brands from various sectors including ready wear, fast food, jewelry and glassware are running huge discount campaigns as part of Istanbul Shopping Fest, which will last 40 days and 40 nights starting March 18. The shopping fest is expected to make a $500 million contribution to Istanbul’s total retail trade, according to data gathered by daily Radikal. Nearly 150,000 more tourists are expected to come to Istanbul, in addition to 750,000 tourists coming to Istanbul during March and April for the Christian Easter holiday and Nevruz celebrations. Companies will sell their new collections with discounts varying between 30 percent and 50 percent. 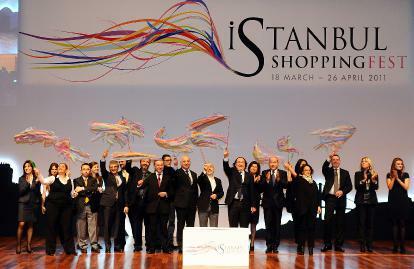 Some of the shopping centers in Istanbul will remain open until 2 a.m. during the festival. Parties and special lucky draws at the shopping centers will be organized to attract domestic and international shoppers. The festival will kick off with two parties held by fashion magazine Vogue in İstinye Park shopping center and Cosmopolitan magazine in Torium shopping center on Friday night, according to Füsun Çevikel, co-chairwoman of the executive committee of the festival.